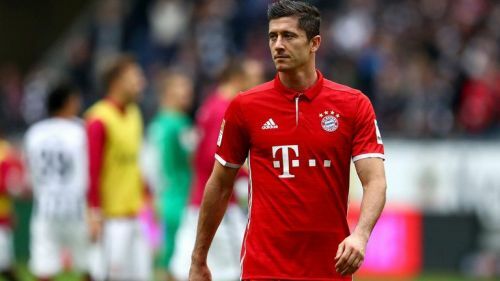 Robert Lewandowski has hinted that he could retire at Bayern Munich. The rumours regarding his move away from Bayern seem to be baseless as he has come forward and made it clear that he wants to stay at the club. He further added that the motivation to break more records might make him stay longer in Munich. Robert Lewandowski is regarded as one of the greatest strikers of this generation. The Polish star striker has proven his worth at both club and International level. After impressing with Borussia Dortmund, the Polish striker made a move to title rivals, Bayern Munich on a free transfer. The move has benefited both the parties as the striker has scored 197 goals for the Bavarian club. In the process, he has also become the top-scorer in the history of the club among non-Germans. Apart from UCL, he has achieved everything and there were rumours which said that Lewandowski might make a move to win the UCL. "I can imagine it (Bayern being my last European club), because it's a great city, a great club that will develop even more from next season. I want to break more records, the thought that I could make my mark on the pages of history could make me stay in Munich." Lewandowski told Przeglad Sportowy [via ESPN]. Robert Lewandowski made no attempt to hide his dream of lifting the UCL trophy. To win that trophy, he would need to be at the top of his game against Liverpool as the tie is evenly balanced at 0-0. While a loss might hurt, the star striker has made it clear that he won't stop trying to achieve his dream. "This (winning the Champions League) is definitely my dream, but if we do not get into the final, I will not write this season off. If I do not succeed, I will keep trying," Lewandowski said. Bayern Munich fans should wait a bit before celebrating as the striker has claimed that the contract talks are yet to begin. A reporter asked Lewandowski if he would keep trying with Bayern. To this, he replied that "We'll see, there have not been any talks yet".